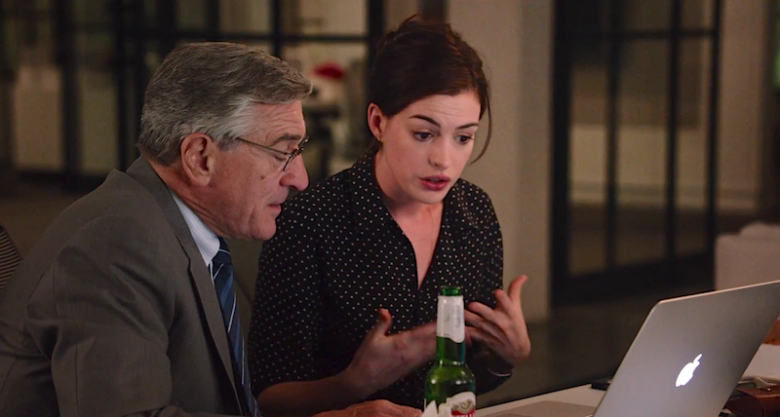 The Intern stars Robert De Niro as the lovely and adorable Ben, a phone book businessman who is bored to tears by his retired life so he signs up to become a ‘senior intern’ at an up and coming online clothing company. There, he encounters the slightly neurotic and overwhelmed creator of the company, Jules, played by the dazzling Anne Hathaway. When Ben is assigned as Jules’ intern assistant, she wants nothing to do with him but Ben soon becomes the unsung hero of the office, solving problems left, right and centre without asking for anything in return. It doesn’t take long for Jules to warm up to him and soon, she’s calling him her best friend. 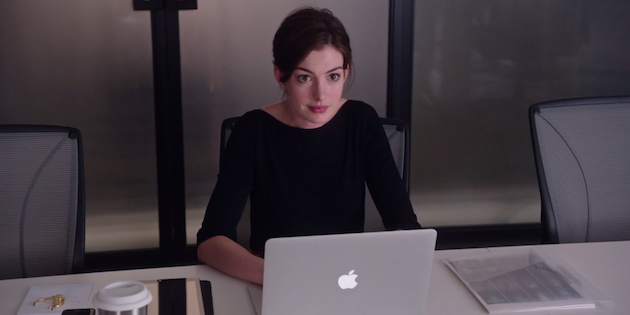 From the very beginning of the movie, The Intern captured the full attention of the audience. It’s been a while since I’ve heard audible gasps and exclamations from moviegoers and it was as if this movie had a second soundtrack, provided by the spectators. There’s something especially comforting about a movie theatre rumbling with laughter and this happened on multiple occasions during The Intern. Hathaway portrays Jules, a young and successful entrepreneur who’s website, ‘About the Fit,’ goes from an idea in her head to a functioning company in less than 18 months. This makes her character a lot more grounded than most stereotypical business exec characters. That’s what makes The Intern so enjoyable, the main characters tend to stray from predictable archetypes. De Niro plays Ben with an ease that is truly inspiring. You would think it might be difficult to keep a through and through ‘good’ character away from being downright boring and one-note but there’s something about De Niro’s honest performance that makes Ben’s character completely believable. While at times I worried that it would turn into the Hollywood classic, age gap romance, thankfully, The Intern never went there with De Niro and Hathaway. This choice to avoid this romantic comedy cliche kept their relationship in the platonic realm which makes Jules and Ben’s relationship even more powerful. The chemistry between De Niro and Hathaway is palpable, pulling you into their character’s lives and feelings with every scene they have together. Jules and Ben’s friendship is made believable through Hathaway and De Niro’s acting which at moments just comes across as two humans having an honest conversation. While some of the plot points are a little extreme, nothing comes out of the left field. There’s never a deus ex machina moment that solves everything. The characters have to deal with the problems themselves which is refreshing in this genre. The absurdity of every bizarre situation that arose lay in reality, making The Intern not only relatable but unique. I give The Intern 4 raindrops out of 5. If you’re looking for a feel-good, heartwarming but surprisingly hilarious movie with a strong cast, The Intern is definitely for you. 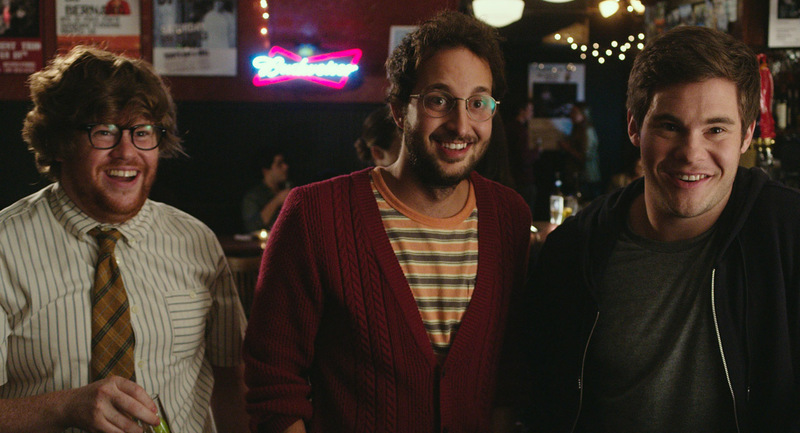 The Intern hits theatres nationwide today, Friday, September 25.